Digitally encrypted storage providing clients around the clock access to their financial life. Generational Vault is a secure, cloud-based portal for our clients that documents every step of the planning process and gives you 24/7 access to your financial lives, allowing you to manage and organize your retirement. Now, clients can easily view their portfolios to make sure their investments are doing what they are supposed to do. 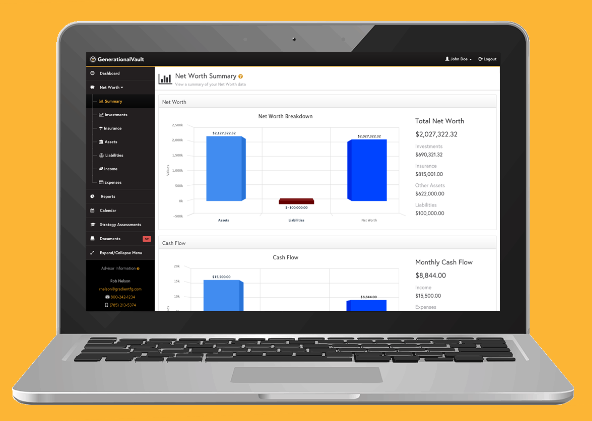 Designed to provide a consolidated view of your investment values that can be automatically updated on a daily basis with charts and graphs depicting results. Clients also have the ability to enter held-away accounts, allowing you and your advisor to have a better picture of your overall financial situation in the Generational Vault. Collecting and updating consumer financial information is important, but displaying it in an easy-to-read manner can be challenging. Using Generational Vault, you can print, download and save information. Unique reports display financial information in a format depending on what you are looking for. Generational Vault was designed to serve as a 24/7 online filing cabinet to help clients organize personal documents and financial statements. You and your advisor can load information into the vault where you can always access you most important information — all you need is internet access.